Posted by Zeben Ashton on Thursday, December 31, 2015 in General Information, Living on Campus, Nashville. As I sit with my family in Maine looking out on the first snowstorm of the year, I can’t help but think about what an exciting year it has been for Vanderbilt and OUA. Our staff has seen another year for the record books, as we’ve traveled to almost every state in the nation (accumulating record levels of frequent flyer miles along the way). In honor of the closing of the year, I’ve complied an exciting (or what I think is exciting) list of some of the things that took place here in Nashville this year. I present to you the 2015 Vanderbilt University Office of Undergraduate Admissions End of the Year Recap. New faces in the Office of Undergraduate Admissions: In June of 2015 we welcomed a new cohort of counselors to the Undergraduate Admissions staff. While it’s always sad to see colleagues move away from Nashville, it’s certainly fun to have new counselors to add to our dynamic lunchtime discussions here in the office! Continued Commodore Excellence – National Champions and National Runner-up: This summer was another exciting time for Vanderbilt Athletics. 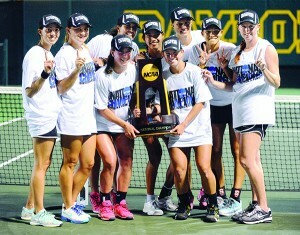 Our Women’s Tennis team ousted the returning national champions, UCLA 4-2 during the Division I Women’s Tennis Championship in Waco, Texas for Vanderbilt’s first Tennis National Championship title. Continuing their success from last year’s National Championship title, our Vandy Boys earned the National Runner Up title in Men’s Baseball against a familiar rival, University of Virginia. New Engineering and Science Facilities: Excitement continues to build around one of our newest buildings. The School of Engineering will open the doors to the new Engineering and Science Building which will include an Innovation Center intended to bolster the campus culture of interdisciplinary problem-solving, creativity and entrepreneurial endeavors. 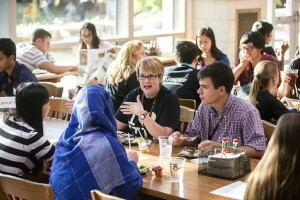 The Vanderbilt Portal to Mexico City: The Martha Rivers Ingram Commons welcomed “Portals” to campus this fall, allowing students to converse directly, face-to-face with people in Mexico City, Mexico. This temporary art installation allowed individuals and classes alike to delve even further into the content of the first year book reading assignment The Madonnas of Echo Park. 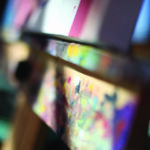 Vanderbilt is one of only three institutions of higher education to host this public art installation. 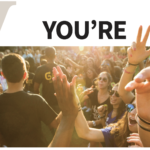 Recognition and Accolades: For the second year in a row Vanderbilt was recognized for having the happiest student body by Princeton Review. In addition to holding on to this accolade, Vanderbilt received high marks for quality of life, great financial aid, college city, and students engaged in community service. 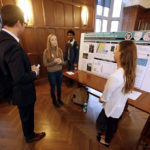 In addition, Vanderbilt received the highest ranking in its history with a jump to fifteenth on U.S. News and World Report’s annual “Best National Universities” list. New Dean of the Martha Rivers Ingram Commons: After the long and successful tenure of Frank Wcislo as the inaugural Dean of the Martha Rivers Ingram Commons, Vanderbilt welcomed our newest Dean of The Commons, Vanessa Beasley. A Vanderbilt alumna, Dean Beasley serves as an Associate Professor of Communication Studies and as an expert on race, gender, and diversity in U.S. political rhetoric. 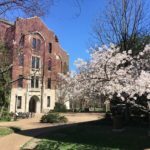 Moving to a Greener Campus: In April, Vanderbilt celebrated the conversion of our power plant from coal-powered to natural gas. With this change came the demolition of the 200 foot smoke stack at the heart of campus. Our entire community celebrated the forward progress in continuing to increase our social responsibilities as stewards for good and our commitment to environmental sustainability. A record-breaking class of new students: In 2015 we saw our largest and most qualified pool of applicants ever with over 31,000 prospective Commodores. From this incredibly qualified group of students we were able to admit our most selective class of students in history. Our continued dedication to increasing the overall strength of our applicant pool through high school visits, evening programs, college fairs, and on-campus visit events is showing results. 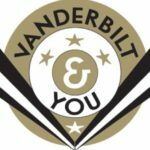 As any of the counselors in our office will tell you, the opportunities we have to meet prospective Vanderbilt student’s only makes our job more exciting. With 2015 in the books, the Vanderbilt University Office of Undergraduate Admissions is looking forward to all that 2016 has to offer. From all of us in Nashville, we wish you a happy and prosperous New Year. Anchor Down!